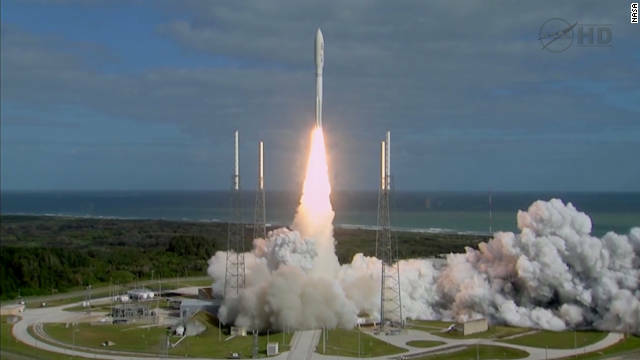 NASA’s biggest and most advanced Mars rover blasted off Saturday from Cape Canaveral, Florida. Curiosity is packed with 10 science experiments to determine whether Mars has ever been suitable for life and to find clues about past life forms that may have been preserved in rocks. NASA says Curiosity won’t answer the age-old questions about life on Mars, but it will provide important information that will guide future missions. The launch was originally scheduled for Friday, but the mission team took an extra day to remove and replace a flight termination system battery, NASA said. Curiosity is expected to spend about two years roaming Mars, hunting things researchers say are essential for life to grow: liquid water, key chemicals used by living organisms and an energy source. The rover lifted off Saturday atop an Atlas V rocket and is scheduled to land in August 2012 in the Gale Crater. Curiosity is twice as long and five times as heavy as the older Mars rovers, Spirit and Opportunity. Its science instruments weigh 15 times as much as its predecessors' science payloads. The rover has a mast that can extend to 7 feet (2.1 meters) to hoist a high-definition imaging system. It also will hold a laser-equipped camera that can zap rocks to study the sparks emitted for information about their composition. A 7-foot-long robot arm will hold instruments for soil analysis. Unlike earlier rovers, Curiosity can gather rocks and soil to process inside its lab. The rover also has tools to look for water beneath the surface, to monitor the weather and to measure natural radiation. Curiosity is designed to roll over obstacles up to 25 inches (about 65 centimeters) high and to travel about 660 feet (200 meters) per day. Its energy source will be a radioisotope power generator. Landing will be tricky because of the rover’s size. As it descends, the spacecraft will make S-curve maneuvers like those used by shuttle astronauts. Three minutes before touchdown, a parachute and retrorockets will slow the spacecraft. Then, seconds before touchdown, an upper stage will act like a sky crane, lowering the upright rover on a tether to the surface. When Curiosity arrives at Mars, three satellites already in orbit will be listening: NASA’s Mars Odyssey and Mars Reconnaissance Orbiter and the European Space Agency’s Mars Express. The spacecraft will be positioned to receive transmissions about Curiosity’s status and relay information to Earth. Usually I don't learn post on blogs, however I wish to say that this write-up very pressured me to check out and do it! Your writing style has been surprised me. Thank you, quite nice article. Search rental and sale listings of lofts and apartments in Manhattan. Our NYC Neighborhood guides will help make your Real Estate decision. Die Daten ffcr den Maestro stimmen so nicht. Ich habe sslebt einen Maestro gehabt der Baujahr 1986 war. Und zur gleichen Zeit waren auch der Metro und der Montego im Rover Programm. >Curiosity is designed to travel about 660 feet (200 meters) per day. At this rate, it can't even do one mile per week. Why can't they send up a rover that could do at least five or ten miles per hour:? Is this a serious question? How old are you? Quite simply running into a rock outcropping and damaging the rover would be a mission ending event. Let's go slow and get as much science out of this rover as possible. Also we've got a number of satellites with ultra high powered cameras / spectrometers so we can be very choosy about where we drop the rover so we don't need to drive great distances to get to the stuff that we looked at from orbit and decided to further investigate. All planet had water on them an Mars no exception. Warm of mio-organism clum together over billions of years and produce organic material then it heated up and fusion set in thereby steam form cloud then rain. Looking down on all similar barron plant are as close similar to our Moon,alone with craters.